Matrix is our finest elastic bandage. 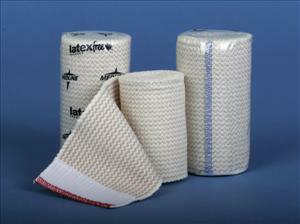 Ideal for low compression situations, the polyester/cotton weave provides excellent elasticity and recoverability. Features an easy-to-use Velcro® closure at both ends and is color-coded for easy size identification on both ends of roll. Latex-Free. Non-Sterile ' 6" x 10 yards.